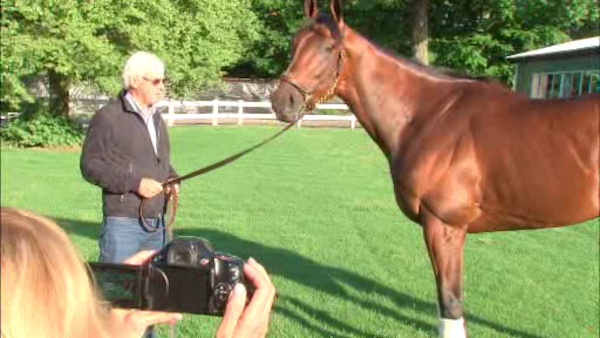 OCEANPORT, N.J. -- Triple Crown winner American Pharoah received star treatment as he arrived to prepare for Sunday's $1.75 million Haskell Invitational at Monmouth Park. After landing at Atlantic City airport, racing's biggest attraction was led off the plane, then escorted by New Jersey State troopers for the final leg of the journey. The van he was loaded into was decked out like Taylor Swift's tour bus with his name splashed across the side. A cluster of reporters awaited him when the van pulled into the Monmouth barn area shortly after 4 p.m.
As usual, American Pharoah was cool and collected, even on a blazingly hot afternoon on the Jersey Shore. He calmly stepped off the van, took two short turns outside the barn where he will reside through the race before heading into the shade for a bath and a nap. It was the end of a long day that started at 1:30 a.m. in California. New Jersey Transit will add additional trains to help get horse race fans to the park. The state department of transportation says NJ Transit will add four additional trains for fans departing after the race. The transit agency will also work with local law enforcement to make sure traffic moves smoothly on Route 36 to the Garden State Parkway. Summer Shore Express trains to New York Penn Station will also stop at the track. NJ Transit says riders should buy roundtrip tickets in advance as there are no ticket vending machines at the track train station.